BRYAN EATON/Staff Photo. Amesbury Schools interim superindendent Gary Reese and his son Jacob, 12, sort through Valentine cards at Amesbury Chevrolet along with other volunteers. 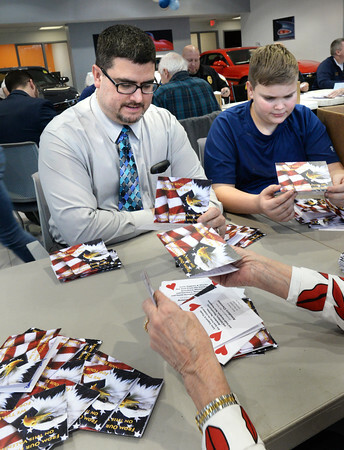 The cards have been collected at various institutions around town, like schools, and are destined wounded veterans currently staying at the Walter Reed Hospital in Maryland.